We have just completed updating the product pages for our XPages based IQJam application. The pages now include updated screenshots, pricing, documenation, product brochures and more. One surprising fact about IQJam is that many companies are not only using it to share knowledge but also to learn XPages development. Pretty cool. Let me know if you have any questions about IQJam or would like to schedule a demonstration. We will also soon be posting a demo page showcasing the IQJam API. Questions can now be answered by email and can include file attachment(s). The search facility now allows searches to be restricted to an IQSpace. It is now possible to follow tags for email notifications as well as for IQSpaces and for questions. There is now an “Import” facility that allows for the importation of questions and answers from other systems. All emails sent from IQJam now use HTML formatting for layout. Take a peek at the IBM Community IQJam site and see IQJam in action. Customers can download IQJam V1.2 from the Elguji download site. Good as Gold: Built with XPages. Used by People. I am happy to announce that IQJam version 1.1 has gone gold. IQJam is Elguji's popular question and answer community software. 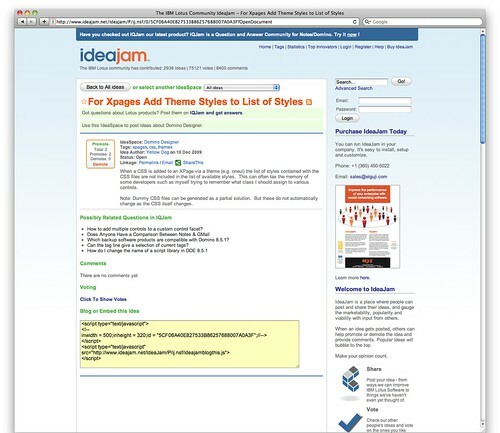 Version 1.1 was built with IBM's XPages 8.5.2 technology and you can take IQJam for a spin on our IQJam.net site. Attachments can now be included with answers. Connections Business Cards integration for Views, Questions and Answers. Multi-lingual configurations are now supported. Support for JSONP for cross-domain API access. Added new button to mark an unanswered question as closed (i.e. the question is no longer relevant). Added a new method "getExperts" to the Web Services and JSON API's. Added a new method "getAnswers" to the Web Services and JSON API's. Added a new method "securityservice" which will return the Security Key for a user when you pass in their username and password to the Web Services and JSON API's. A Domino login form has been added for secure IQJam sites. The Rich Text Editor has been upgraded to use the CK Editor shipped with Domino 8.5.2+. Added an option to the Control Panel to enable/disable the "Feedback" link in the page footer. Added an option to the Control Panel to enable/disable the "Developers" link in the page footer. Customers will be able to download V1.1 later this week. A set of JSON methods will also be provided with IQJam and will offer equivelant functionality. There are also several other methods that are currently being developed. All of these services can be found on the Developers link located at the bottom of every IQJam page.